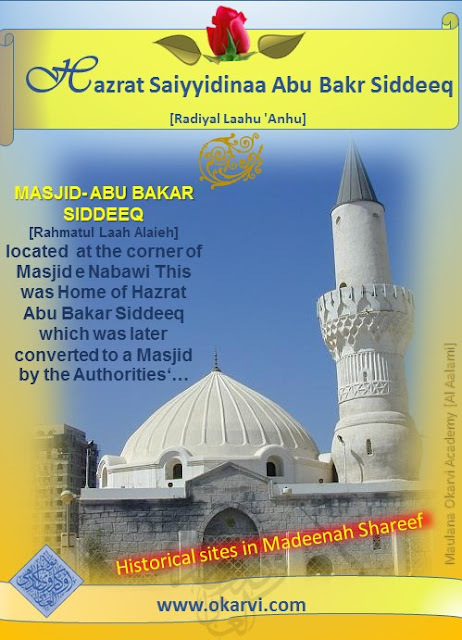 Masjid Abu Bakr Siddeeq [Radiyal Laahu Anhu] is located at the corner of Masjid e Nabawi Shareef in Madinah –Arabia. It is located at the west southern side of the Honorable Prophet’s Mosque, and it is about (1000) meters from its current fence. This was Home of Hazrat Abu Bakr Siddeeq [Radiyal Laahu Anhu] which was later converted to a Masjid by Authorities. It is narrated that the Prophet Muhammad [Sallal Laahu Alaieh Wa Sallam] prayed Eid prayer at this site, and Abu Bakr Siddeeq [Radiyal Laahu Anhu] after Him during His Caliphate, so it was attributed to Him. It was built-up for the first time in the Princedom of Omar Bin Abdul Aziz in Al Madeenah (86-91 A.H./705-709 A.D.), and it was renovated by the Ottoman Sultaan Mehmood II in 1254 A.H./1838 A.D. It is square shaped and the length of its side is nine meters. It was built by black basalt stones, and was painted white from inside with a dome above it whose height is (12) m. Within the walled area is a small rectangular courtyard. The minaret is an austere cylindrical shape also capped with a green metal cone..
[Sallal Laahu Alaieh Wa Sallam] said, O ‘Abu Bakr, You made place for me in the cave, I will make place for you in my Burial Chamber (Mazaar). 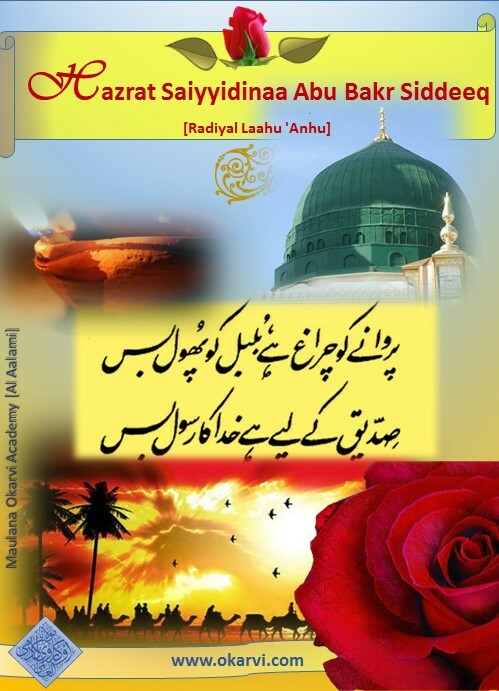 In the cave I slept on your lap but in my Burial Chamber you will sleep in my proximity.’ Unto this day Hazrat Abu Bakr Siddeeq [Radiyal Laahu Anhu] rests in the blessed Burial Chamber. of Fakhr ud-Deen al-Raazi and "Al-Kasa'is al-Kubraa"
Refer to both of these books.
. عن علي بن أبي طالب قال لما حضرت أبابکر الوفاة أقعدني عند رأسه و قال لي يا علي إذا أنا مت فغسلني بالکف الذي غسلت به رسول اﷲ و حنطوني و اذهبوا بي إلي البيت الذي فيه رسول اﷲ فاستأذنوا فإن رأيتم الباب قد يفتح فادخلوا بي وإلا فردوني إلي مقابر المسلمين حتي يحکم اﷲ بين عباده قال فغسل و کفن و کنت أول من يأذن إلي الباب فقلت يا رسول اﷲ هذا أبوبکر مستأذن فرأيت الباب قد تفتح و سمعت قائلا يقول ادخلوا الحبيب إلي حبيبه فإن الحبيب إلي الحبيب مشتاق. Hazrat Abu Bakr Siddeeq had requested that when he leaves this world, for the realm of Divine Beauty, he should be shrouded, the Funeral Prayer prayed and then taken to the Sacred Burial Chamber of the Holy Prophet [Sallal Laahu Alaieh Wa Sallam]. 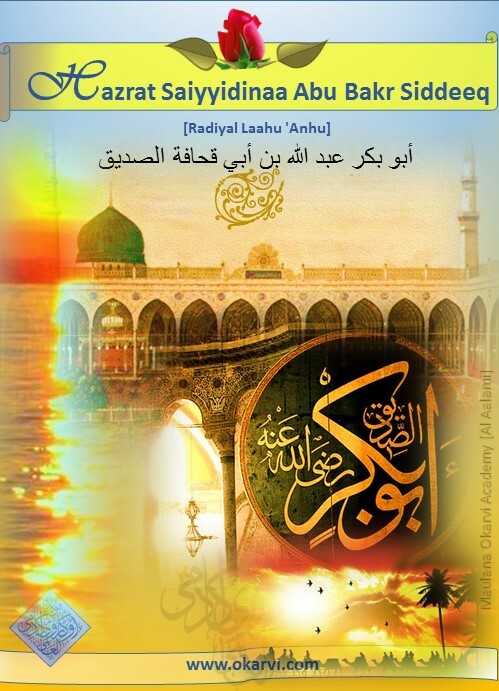 So Hazrat Abu Bakr Siddeeq [Radiyal Laahu Anhu] was buried within the Sacred Burial Chamber. Ponder, leaving your doubts and sectarian preconception aside upon Hazrat Abu Bakr Siddeeq’s request to be taken to the Holy Prophet e’s Burial Chamber, to greet, to proclaim that Abu Bakr is present and to say if the door opens on its own then I must be buried inside. Should not the Companions have stated as to who will open the door for the Holy Prophet[Sallal Laahu Alaieh Wa Sallam] is buried and dead. The fact that Hazrat Abu Bakr Siddique [Radiyal Laahu Anhu] requested this and the Companions carried out his request are proof that the Companions believed the Holy Prophet to be alive (Hayaatun Nabee) and functioning. His tasarruf is prevalent unto this day. The door opened and the voice spoke from the grave. So I cried witnessing the love of the Holy Prophet [Sallal Laahu Alaieh Wa Sallam]for his community and seeing the status of Hazrat Abu Bakr Siddeeq [Radiyal Laahu Anhu]. ”Look at the status of Hazrat Abu Bakr Siddeeq [Radiyal Laahu Anhu], for the Holy Prophet prays to Allaah [Ta’aalaa] using him as a means. Imaam Allaamah Ismaaeel Haqqi Bursevi (1653-1724 or 5) has cited it in his Arabic Tafseer , ‘Ruh al-Bayaan’ . He was born in Makkah some time in 573 CE, to a rich family of the Quraish tribe. in the cave [Ghar e Sau/Thawr/Thaur when they traveled to Madeenah by Allaah Almighty’s Command. 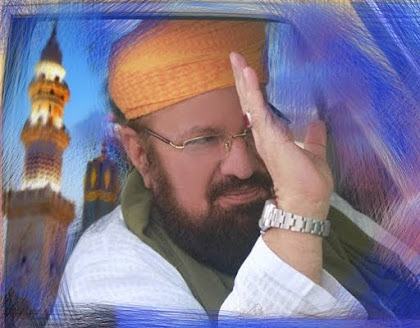 His conversion brought many people to Islaam. He persuaded his intimate friends to convert to Islaam and presented Islaam to others in such a way that many of his friends accepted Islaam. That he was instrumental in preserving the Qur'aan in written form. That he was the one to fill the political gap and guide the nation after Rasoolul Laah [Sallal Laahu Alaieh Wa Sallam] passing away. 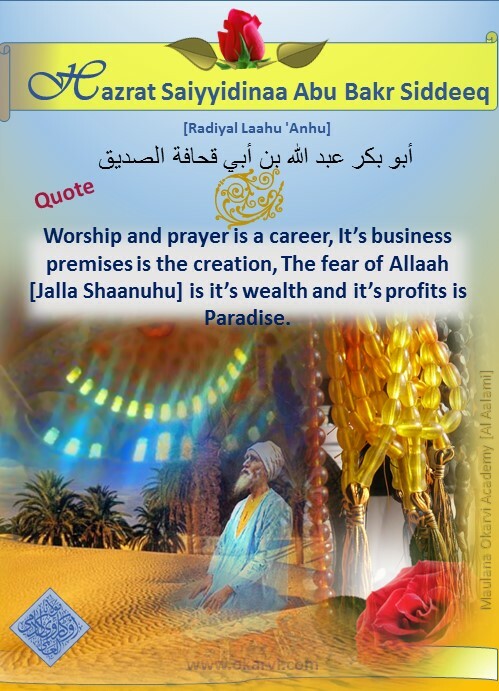 That Allaah Kareem’s creations confirmed the high status of Al – Siddeeq. Believers love all the things and place that has any relation with Hazrat Muhammad ﷺ. All these places are sacred; a loving Mumin would like to sacrifice his life and wealth to visit these places. Prophet Muhammad ﷺ migrated to Madeenah because inhabitants of Makkah became his enemy after pronouncement of prophet hood. Chiefs of the tribes met in the Dar-u-Nadwah and decided to slay Prophet Muhammad ﷺ. All the tribes provided the swordsmen and these swordsmen besieged the house of Prophet with naked swords in their hands with their bad intention; in the house, Prophet of Allaah ﷺ and Hazrat Alee [Radiyal Laah Anhu] were present. Prophet Muhammad ﷺ had the deposits / trusts (Amaanat) of people of Makkah which he handed over to Hazrat Alee [Radiyal Laahu Anhu]and asked him to sleep on the bed, hand over the deposits to their respective owners and then come to Madeenah as Prophet was leaving for Madeenah. This cave is located in the mountain of Saur nearly three miles away from the Holy city of Makkah at the height of about 1 to 1-1/2 miles. Now there are steps to climb the mountain. The Holy Prophet [Peace be Upon Him] had stayed in this cave for three days and nights when he set off on migration from Holy city of Makaah to the sacred Madeenah Shareef.